The french presidential election (in april/may 2007) will use plurality voting with two rounds (voters will choose 1 amongst 11 or 12 candidates during the first round. The two candidates with the most votes will be qualified for the second round). Since only the two first candidates are qualified to second round, Bayrou wouldn’t be elected. It will be interesting to see how those scores evolves until the first round (April 22nd). I’m not sure the condorcet method is the best in such a type of election. Because in my opinion, this method failed when the opinion is mostly bipolarized (what we call “gauche/droite” –left/right or democrats/republicans–) like in the french opinion and that there is a majority of candidates of one part. Indeed, I think it will always be one candidate of the most representated pole who will won. 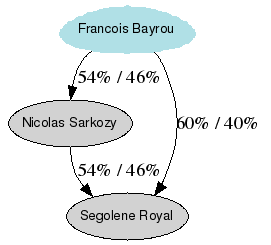 And in your exemple, there is only one candidate of the “gauche” for mostly 3 for the “droite”.